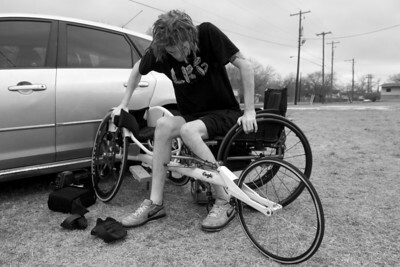 Moving from his regular wheelchair to his racing wheelchair can be a challenge, but Austin handles it with ease. Austin drives his Mazda 3 hatchback using a hand control for the accelerator and brakes. 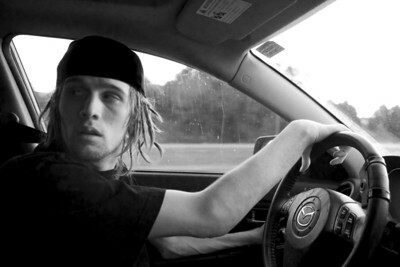 He transfers himself from his wheelchair to the driver’s seat, takes the wheels off the chair, folds it up, and puts the chair and wheels next to him in the front passenger seat. 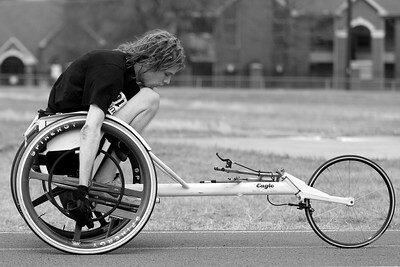 Wheelchair Racing is quite a workout for Austin since he doesn’t have the use of his abdominal muscles but he likes to go “push” to train for future competitions. 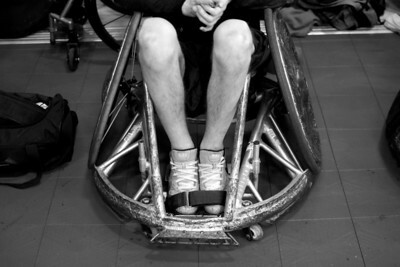 Rugby Wheelchairs are made to withstand hard hits and lot of abuse. 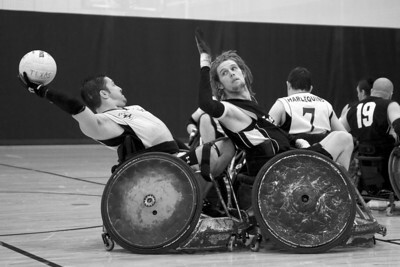 Austin attempts to block a pass during a wheelchair rugby match against the Denver Harlequins. 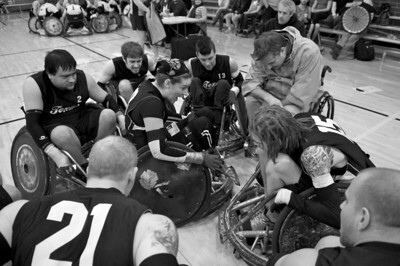 The Texas Stampede Wheelchair Rugby Team gets fired up before a match during the Texas Thunder Invitational Tournament in Cedar Park, Texas. 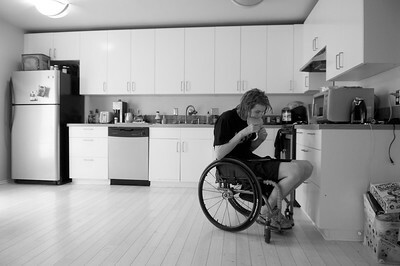 With limited use of his hands, Austin uses his teeth to help with tasks that require grasping, such as wrapping his wrists with tape for a wheelchair rugby match. 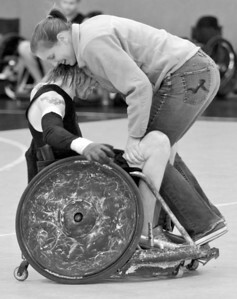 Austin's girlfriend Lindsey hops on for a ride during a wheelchair rugby practice. 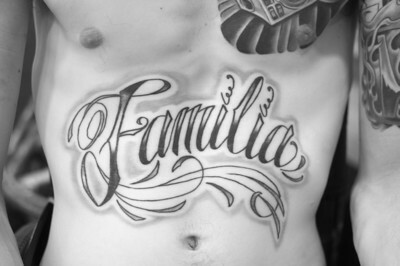 Family is important to Austin as shown by the large "Familia" tattoo across his stomach. 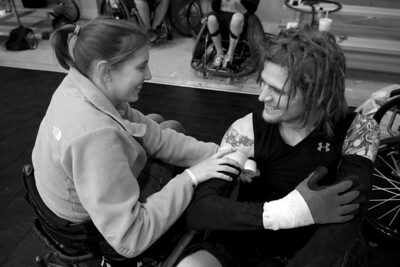 Austin’s girlfriend, Lindsey, helps him wrap tape around his arms during a wheelchair rugby practice. Austin is pursuing a degree in Graphic Design from the Art Institute of Austin and is starting a clothing company called Twenty Ten Clothing. 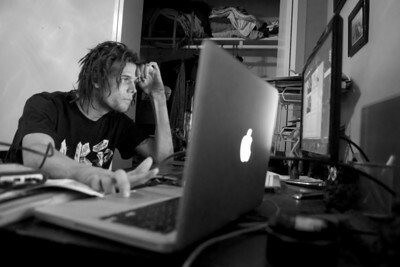 Here he is seen working on the design for business cards for his new company. Austin eats a quesadilla he made at his duplex that he shares with his girlfriend, Lindsey. 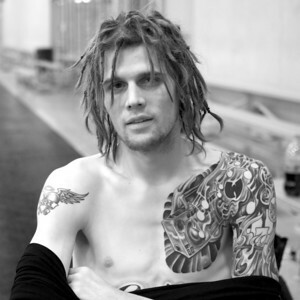 Austin shows some of his tattoos during a practice for the Texas Stampede Wheelchair Rugby Team. 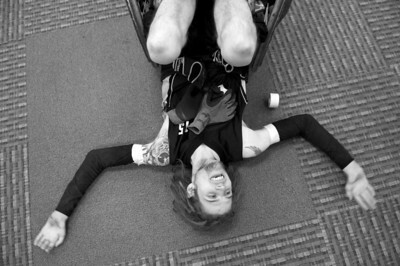 Austin laughs while he lies on the ground to let his dad work on the bottom of his rugby wheelchair.